A Gallup poll that has just come out on February 23, finds that overall support for Israel remains strong in America as 70% of Americans view Israel favorably. While 70% is a big number, as a strong supporter of Israel, I even wish that number would be a lot higher. There is also much greater support for Israel over the Palestinian authority in America. Looking deeper into the numbers, we can see why there is not even a higher support for Israel among Americans, as Democrats are bringing down the percentage. Gallup finds a stark difference among Americans by party with regards to support for Israel, and for who Americans favor most in the Middle East. While Republican support in sympathy with Israel over the Palestinains has risen to over 80%, "the percentage of Democrats sympathizing with Israel fell 10 points this year to 48%, possibly reflecting the tension between Obama and Netanyahu,"
That's incredible to me. Israel, always has been a bi-partisan issue, but Gallup finds that 48%, that's less than half of Democrats, sympathize with Israel over the Palestinians. Also, Gallup finds that while the Republicans are almost unanimous in support of Israel [i.e., viewing them favorably] "the percentage of Democrats viewing Israel favorably is also down, currently at 60%, vs. 74% a year ago." 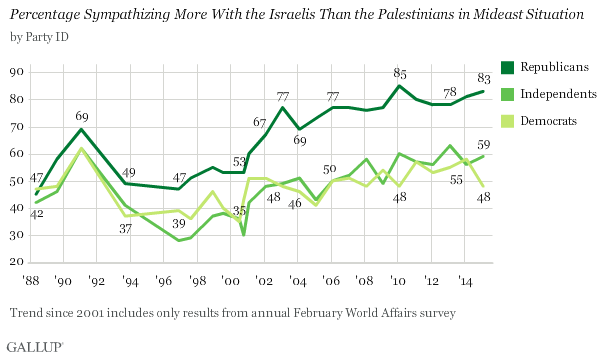 Check out this graph from the Gallup web site of the views of Democrats, Repubicans and independents on their sympathy of Israel vs. Palestinians [Palestinain Authority]. This is one more reason, with all of the tension and strife in the Middle East, and with the not pro-Israel president [to be kind] Barack Obama as president of the United States, I thank God the American people elected a strong Republican congress [House and Senate] to counteract him. I pray that in 2016 the American people will select an American president who, once again, is pro-Israel in these dangerous times. You can read the entire Gallup article by Lydia Saad, "Seven In Ten Americans Continue To View Israel Favorably" by clicking here.